NIN Jobs Recruitment Notification 2018.National Institute of Nutrition, NIN inviting applications for the positions of Technical Officer, Technician, Consultant.Interested and Eligible candidates can apply for the positions. a. Candidates should be a graduate in Food & Nutrition or equivalent from a recognized university and have five years of work experience from a recognized institution. Candidates should possess Masters Degree in Food & Nutrition or equivalent from a recognized University. c. Candidates should possess Master's Degree in Biochemistry from a recognized University. 2. Desirable: Practical knowledge of various nutrition assessment tools like diet surveys, macro/micronutrient evaluation, menu planning and food formulations, nutritional status and body composition. Flexibility for travelling to various parts of the country as part of data collection. Conversant in biochemical analysis like glucose, lipids, enzymes etc., chromatography, immunochemical assays, protein isolation and estimation. An experience of operation and maintenance of basic laboratory equipments. To be roficient in statistical and computer productivity software's Word, Excel etc. 1. Candidates should be 12th pass in science subjects and 2 years Diploma in Medical Laboratory Technician (DMLT) from a recognized institution. OR Candidates should be 12th pass in science subjects and one year of Diploma in Medical Laboratory Technician (DMLT) plus one year required experience in a recognized organization or two years field or laboratory experience in relevant subject. 2. Graduate in Life sciences. An experience of operation and maintenance of basic laboratory equipment's and able to draw blood samples of athletes. To be proficient in statistical and computer productivity software's (Word, Excel etc. 3. Level-8 in the Pay Matrix of CPC, Initial Pay Rs.47,600/- plus usual allowances as per rules. 1. Graduate from any disciplines . Experience in anthropometry and body composition techniques. OR Retired govemment employees with graduate degree in any discipline from a recognized University. Research and work experience: Should have minimum of 20 years of experience in required domain or field of sports. 2. Experience in carrying out basic anthropometric measurements including skinfold and body composition assessment. Knowledge in handling basic statistical and computer productivity software's (Word, Excel etc.). Rs.47 ,600-00 (fixed) per month without any allowances. 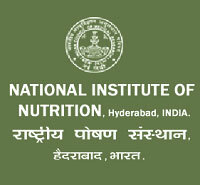 National Institute of Nutrition, Tarnaka, Hyderabad - 500 007, Telangana. 2. The persons belonging to Other Backward Category should bring the latest O.B.C. (Non-creamy layer) Certificate issued by the respective Tahsildar/ MRO specifically issued for the purpose of applying for Central Government Posts. No TA/DA will be paid for attending the Written Test/ Interview. The recruited project staff is eligible for leave as per rules and have to give an undertaking before joining. 3. Walk in interview will be held on 18th June, 2018 from 09:30 a.m. onwards. 4. The applications will be received from the Individuals on the day of Walk-in-Written Test/ Interview between 09:30 AM and 10:30 AM at NIN. Late Applications will not be entertained after 10:30 AM. Application forms will be provided to the candidates at the venue on the day of Walk-in-Written Test/ Interview. Candidates may download the application form from the above website.